Congratulations to Chun-Ting Huang for passing his defense on January 18, 2016. 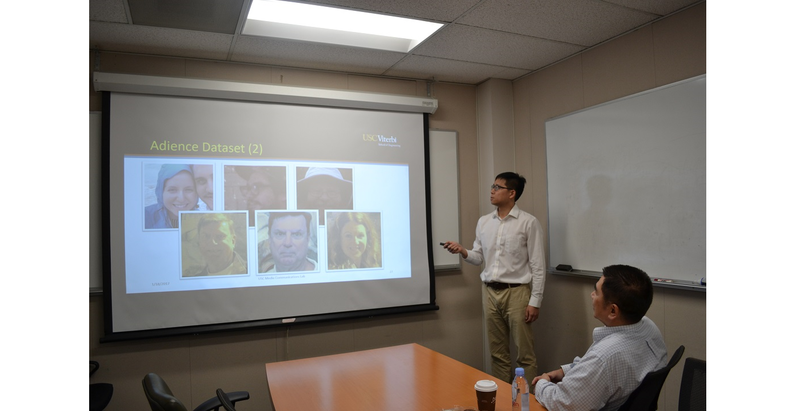 His Ph.D. thesis is entitled “Facial Identity Recognition and Attribute Classification Using Machine Learning Techniques”. Robust face recognition plays a central role in biometric and surveillance applications. Although the subject has been studied for about four decades, there still exist quite a few technical challenges and system design issues in deploying it in a real-world video surveillance environment. Nowadays, the raw face images and their associated meta data are stored in a remote cloud storage system in a distributed face recognition platform. One key challenge in the overall system design is to ensure the security of stored data. In this research, we first conduct a survey on this technology and then, study the problems of cross-distance/environment face recognition and facial attribute classification with machine learning techniques. The problem of long distance face recognition and attribute classification arising from surveillance applications impose major challenges. The captured face from the surveillance system can be low resolution and quality, which is further degraded by an uncontrolled outdoor environment such as long distance during daytime or nighttime. In addition, human age/gender inferred by face images are fundamental attributes in our social interactions. This research has many applications such as demographics analysis, commercial user management, visual surveillance, and even aging progression. Despite the rapid development in automatic face recognition, there is far less work on automatic age/gender classification in an unconstrained environment. Research in this dissertation provides effective solutions to three topics: 1) cross-distance/environment face recognition, 2) cross-distance/spectral face recognition and 3) age/gender classification. For Topic 1, a two-stage alignment/enhancement filtering (TAEF) method is proposed to achieve the state-of-the-art performance. For Topic 2, a locally linear embedding (LLE) method is developed to restore low quality near-infrared (NIR) images so as to enhance the face recognition performance. For Topic 3, a new framework based on the convolutional neural network (CNN) is presented to achieve efficient age and gender classification using the information from full face and facial components. Congratulations again to Chun-Ting and we wish him all the best in his future career.